So what are two grown men and two hyper labs to do when their duck boat is down for extensive repairs . . . well, heatah huntin of course. For those uneducated in exactly what heatah huntin entails I thought it would be helpful to organize a post to provide a little background. I am fairly certain that most of you southern gents may be familiar with this method of hunting but are more liable to call it AC hunting. 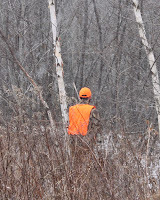 In its most basic form a hunter uses a 4x4 vehicle to navigate far into the backcountry (pounding the snot out of his truck's shock absorption system in the process) in the hopes of having a suicidal ruffed grouse or rabbit sit in the road long enough for the trucks driver to shoot it. A perfectly expedited dispatch is usually followed by the release of the dog who retrieves and then returns it to the truck without the driver having to move more than a couple feet. Though sounding utterly simple in the execution, it never fails that 9.9 times out of 10 the grouse or rabbit wins. On this particular outing the temperatures were in the lower teens and the winds blowing at a sustained 10-15 mph with sizable gusts reaching 25 mph. As the trees were tossed back in forth in the frosty gale I knew that our chances of seeing a bird would be minimal, bordering on impossible and within spitting distance of I hardly think so. Not to be easily discouraged however of we went into the wilds. After many hours of driving we were wondering if we would see anything, until we rounded a bend and out of the corner of my eye a fast shape darted through a low tangle of spruce trees. I instructed my brother to drive up the road a little further and I jumped out of the truck and quickly loaded three shells. Trudging through the tangle of raspberry bushes and burdocks, I made it to where I had seen the quickly moving form and noted a pair of rabbit tracks escaping into the deep woods. As the wind howled around my baseball hat and the blood drained out of my hands I decided that mister rabbit was in no danger this day and I hiked back to the warmth of the pick-up. As the day wore on and the guns failed to go BOOM we became more and more in need of a good adrenaline fix. Minutes before the mandated quitting time, imagine my incredible surprise and good fortune when cruising down one stretch of road this former rock jock and mountaineer came upon a wood yard filled with over half a million dollars worth of climbing toys! Note in the picture it says DANGER, KEEP BACK 300 FEET . . . yes I am crazy. Ok, I am aware that if any loggers or woodsmen are reading this I know I am going to catch some heat . . . but you have to admit its at least a little bit funny!?!? Well the day finished with us not shooting any small game animals BUT we did see a nice spike horn that IF we had been carrying a rifle could have been shot and tagged by my brother . . . oh well the bird hunters always see the deer and the deer hunters always see the birds. Perhaps that deer hunter we saw 2 minutes down the road and told of the sighting ended up shooting that nice spike . . . if he ever was able to get his swearing under control . . . man did that guy look cold as he stalked deer through the snow drifts on that abandoned road . . . maybe he should try heatah huntin?!?!? s'eeven funner If the passenger sits on the hood...course ya gotta have the driver go bout 50 ta really have fun. OHHHHH now I get it.Thanks for explaining,and I read your post on the boat motor that stinks.That's why the call it a boat,break out another thousand. I am glad to see we're not alone in IA. We just call it road huntin. Jodi, I am LMAO right now at your statement that you used to drive a skidder! That is GREAT! If you and your Dad went heatah huntin in his skidder you might be a Red Neck! LOL!